Last night, Bryan and I met up with our great friend Bridget at a cocktail bar that I've been dying to go back to since I went the first time almost a year ago! Violet Hour is a prohibition era, old fashioned, high end cocktail bar.For those readers in the Twin Cities area, Bradstreet Crafthouse is a similar cocktail bar, but Violet Hour provides more of an intimate atmosphere. We loved our experience last night! Our waiter was very nice and social, providing witty comments about various cocktails and light stories about their work environment. The cocktails were amazing! We each had two, and passed them all around to taste. I personally liked the whiskey and potable bitters drinks. The other thing that is cool about this bar is that you have to know about it to get in. 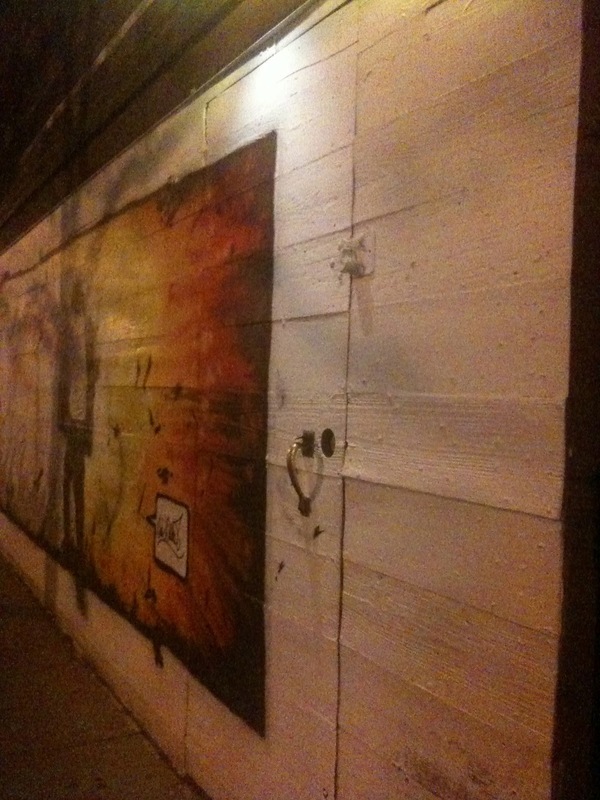 The door is hidden as a part of a mural painting on the street wall (that I believe changes frequently and randomly). There are no signs. Even when you walk in, you think you're at the wrong place because there are dark heavy curtains that separate the entryway into 3 separate spaces before you actually enter the bar! I was so glad I had been there once before so I knew what to look for! Please excuse the grainy picture - that's the iPhone 3GS hard at work.... holdin' out for the 5! No cell phone use inside lounge. If you have a party of four, we'll give you four chairs. If your party is eight, we'll arrange eight chairs for you. No "party add-ons" without prior notification. No O-Bombs. No Jager-Bombs. No bombs of any kind. No Budweiser. No light beer. No Grey Goose. No Cosmopolitans. And finally, please do not bring anyone to The Violet Hour that you wouldn't bring to your mother's house for Sunday dinner.